Download "Dublin Declaration. on Partnership to fight HIV/AIDS in Europe and Central Asia"
3 We have agreed on the following actions to accelerate the implementation of the Declaration of Commitment on HIV/AIDS; Leadership 1. Promote strong and accountable leadership at the level of our Heads of State and Government to protect our people from this threat to their future, and promote human rights and tackle stigma and ensure access to education, information and services for all those in need; 2. Encourage and facilitate strong leadership by civil society and the private sector in our countries in contributing to the achievement of the goals and targets of the Declaration of Commitment; 3. Accelerate the implementation of the provisions of the Declaration of Commitment relating to orphans and girls and boys infected and affected by HIV/AIDS 1 ; 4. Establish and reinforce national HIV/AIDS partnership forums including meaningful participation of civil society, and particularly of people living with HIV/AIDS and their advocates, to design, review, monitor and report progress in the fight against the disease, and to take timely and determined action to identify and address barriers to implementation; 5. In , promote the active involvement of the institutions of the European Union, and other relevant institutions and organisations such as the Commonwealth of Independent States, the Council of Europe, the Organisation for Security and Cooperation in Europe and the Regional Committee of the World Health Organisation, in partnership with UNAIDS through its co-sponsoring agencies and its Secretariat, in our common effort to strengthen coordination and cooperation; 6. Make the fight against HIV/AIDS in Europe and Central Asia a regular item on the agendas of our regional institutions and organisations; 7. Provide increased and results-based financial and technical resources to scale up access to prevention, care and sustained treatment, including effective low cost treatment such as generics, in the most affected countries with the greatest needs through national and regional allocations as well as from the Global Fund to Fight AIDS, TB and Malaria, the European Union, new public and private partnerships, multilateral and bilateral financing mechanisms; Prevention 8. Reinvigorate our efforts to ensure the target of the Declaration of Commitment 2 that, by 2005, at least 90 percent of young men and women aged 15 to 24 have access to the information, education, including peer education and youth-specific HIV education, and services necessary to develop the life skills required to reduce their vulnerability to HIV infection, in dialogue with young persons, parents, families, educators and health-care providers; 9. By 2010, ensure through the scaling up of programmes that 80% of the persons at the highest risk of and most vulnerable to HIV/AIDS are covered by a wide range of prevention 1 Declaration of Commitment of the UN General Assembly Special Session on HIV/AIDS, paragraphs Declaration of Commitment of the UN General Assembly Special Session on HIV/AIDS, target 53, page 21. 5 including increasing public sector investment in vaccines and microbicides to prevent HIV infection; Living with HIV/AIDS 20. Combat stigma and discrimination of people living with HIV/AIDS in Europe and Central Asia, including through a critical review and monitoring of existing legislation, policies and practices with the objective of promoting the effective enjoyment of all human rights for people living with HIV/AIDS and members of affected communities; 21. By 2005, provide universal access to effective, affordable and equitable prevention, treatment and care including safe anti-retroviral treatment to people living with HIV/AIDS in the countries in our region 5 where access to such treatment is currently less than universal, including through the technical support of the UN through the global initiative led by the World Health Organisation and UNAIDS to ensure 3 million people globally are on anti-retroviral treatment by 2005 ( 3 by 5 ). The goal of providing effective anti-retroviral treatment must be conducted in a poverty-focused manner, equitable, and to those people who are at the highest risk of and most vulnerable to HIV/AIDS; 22. Ensure early implementation of the WTO Decision of 30 August 2003 on the implementation of paragraph 6 of the Doha Declaration on the TRIPS Agreement and Public Health; 23. Increase access to non-discriminatory palliative care, counseling, psychosocial support, housing assistance, and other relevant social services for people living with HIV/AIDS; 24. Invest in public research and development for the development of affordable and easier to use therapeutics and diagnostics to support expanded treatment access and improve the quality of life of people living with HIV; 25. Monitor best practices on and take concrete steps to exchange information on service delivery for prevention, treatment and care, particularly for persons at the highest risk of and most vulnerable to HIV/AIDS infection; Partnership 26. Strengthen coordination, cooperation and partnership among the countries of Europe and Central Asia, as well as with their trans-atlantic and other development partners, to scale up local capacity to fight the epidemic and mitigate its consequences in the most affected countries with the greatest needs, and in countries with a high risk of a major epidemic; 27. Involve civil society and faith-based organizations, as well as people living with HIV/AIDS and persons at the highest risk of and most vulnerable to HIV/AIDS infection in the development and implementation of national HIV/AIDS prevention and care strategies and financing plans, including through participation in national partnership forums; 28. Work with leaders from the private sector in fighting HIV/AIDS through workplace education programmes, employee non-discrimination policies, provision of treatment, counseling, care, and support services, and through engagement with policy makers on the local, national and regional levels; 5 The treatment gap in the region is estimated by the WHO to be at least 100,000 people in 2003. 6 29. Involve the national and international pharmaceutical industry in a public-private partnership including with relevant international organisations such as the World Health Organisation in helping to tackle the epidemic along all points of the drug supply chain from manufacturing to pricing to distribution; 30. Ensure effective coordination between donors, multilateral organisations, civil society and Governments in the effective delivery of assistance to the countries most in need of support in the implementation of their national HIV/AIDS strategies, based on ongoing processes on simplification and harmonization particularly the UNAIDS guiding principles; Establish sustainable partnerships with the media, recognising the critical role that it plays in influencing attitudes and behaviour and in providing HIV/AIDS related information; 32. Support stronger regional cooperation and networking among people living with HIV/AIDS and civil society organisations in Europe and Central Asia, and call upon the Joint United Nations Programme on HIV/AIDS in partnership with the European Union, existing civil society networks and other regional partner institutions to assist, facilitate and coordinate such collaboration; Follow-up 33. 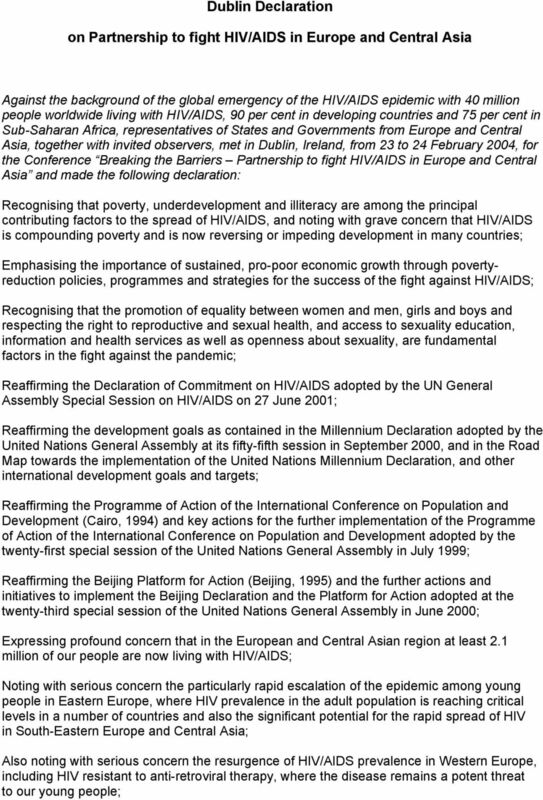 We commit ourselves to closely monitor and evaluate the implementation of the actions outlined in this Declaration, along with those of the Declaration of Commitment of the United Nations General Assembly Session on HIV/AIDS, and call upon the European Union and other relevant regional institutions and organisations, in partnership with the Joint United Nations Programme on HIV/AIDS, to establish adequate forums and mechanisms including the involvement of civil society and people living with HIV/AIDS to assess progress at regional level every second year, beginning in February These are: that there should be one agreed national HIV/AIDS Action Framework that drives alignment of all partners., one national AIDS authority with a broad-based multisectoral mandate, and one agreed country-level monitoring and evaluation system. 4th Global Partners Forum. on Children affected by HIV. Dublin, Ireland, 6-7 October The AIDS Response: Putting Children and Families First? Brazzaville Commitment on Scaling Up Towards Universal Access to HIV and AIDS prevention, treatment, care and support in Africa by 2010.
Review Article Comprehensive HIV/AIDS prevention: focus on youth under threat Hamzullah Khan*, Laetitia J King**, Akber Khan Afridi* * Department of Community Medicine, Khyber Medical College, Peshawar. 2. To understand how personal values and attitudes can impact on the delivery of sexual health services. Positive corporate responses to HIV/AIDS: a snapshot of large cap South African companies Introduction The rate of HIV infection continues to grow with 2.7 million new infections recorded globally in 2007. Company level interventions on HIV/AIDS: 1:What can companies do?